Invasive vegetation on a brick wall. Photo: Richard Wagner, AIA. 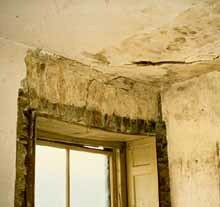 Uncontrolled moisture is the most prevalent cause of deterioration in older and historic buildings. It leads to erosion, corrosion, rot, and ultimately the destruction of materials, finishes, and eventually structural components. Ever-present in our environment, moisture can be controlled to provide the differing levels of moisture necessary for human comfort as well as the longevity of historic building materials, furnishings, and museum collections. The challenge to building owners and preservation professionals alike is to understand the patterns of moisture movement in order to better manage it-not to try to eliminate it. There is never a single answer to a moisture problem. Diagnosis and treatment will always differ depending on where the building is located, climatic and soil conditions, ground water effects, and local traditions in building construction. In this Brief, advice about controlling the sources of unwanted moisture is provided within a preservation context based on philosophical principles contained in the Secretary of the Interior's Standards for the Treatment of Historic Properties. Following the Standards means significant materials and features that contribute to the historic character of the building should be preserved, not damaged during remedial treatment. Applying a waterproof coating to an above-ground masonry wall can trap moisture underneath, causing further damage to the historic material. Photo: NPS files. It also means that physical treatments should be reversible, whenever possible. The majority of treatments for moisture management in this Brief stress preservation maintenance for materials, effective drainage of troublesome ground moisture, and improved interior ventilation. Avoid remedial treatments without prior careful diagnosis. Undertake treatments that protect the historical significance of the resource. Address issues of ground-related moisture and rain run-off thoroughly. Manage existing moisture conditions before introducing humidified/dehumidified mechanical systems. Implement a program of ongoing monitoring and maintenance once moisture is controlled or managed. Be aware of significant landscape and archeological resources in areas to be excavated. Finally, mitigating the effects of catastrophic moisture, such as floods, requires a different approach and will not be addressed in this Brief. Finding, treating, and managing the sources of damaging moisture requires a systematic approach that takes time, patience, and a thorough examination of all aspects of the problem-including a series of variable conditions.Moisture problems may be a direct result of one of these factors or may be attributable to a combination of interdependent variables. Debris will impede the normal flow of water from the roof's gutter and downspout system to the ground and result in moisture problems. Photo: NPS files. Diagnosing and treating the cause of moisture problems requires looking at both the localized decay, as well as understanding the performance of the entire building and site. Moisture is notorious for traveling far from the source, and moisture movement within concealed areas of the building construction make accurate diagnosis of the source and path difficult. Obvious deficiencies, such as broken pipes, clogged gutters, or cracked walls that contribute to moisture damage, should always be corrected promptly. For more complicated problems, it may take several months or up to four seasons of monitoring and evaluation to complete a full diagnosis. Rushing to a solution without adequate documentation can often result in the unnecessary removal of historic materials-and worse-the creation of long-term problems associated with an increase, rather than a decrease, in the unwanted moisture. Water used in maintenance and construction materials. Above grade exterior moisture generally results from weather related moisture entering through deteriorating materials as a result of deferred maintenance, structural settlement cracks, or damage from high winds or storms. Damp interior plaster around windows generally indicates moisture has entered from the outside. Photo: NPS files. Such sources as faulty roofs, cracks in walls, and open joints around window and door openings can be corrected through either repair or limited replacement. Due to their age, historic buildings are notoriously "drafty," allowing rain, wind, and damp air to enter through missing mortar joints; around cracks in windows, doors, and wood siding; and into uninsulated attics. In some cases, excessively absorbent materials, such as soft sandstone, become saturated from rain or gutter overflows, and can allow moisture to dampen interior surfaces. 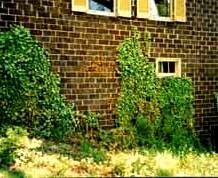 Vines or other vegetative materials allowed to grow directly on building materials without trellis or other framework can cause damage from roots eroding mortar joints and foundations as well as dampness being held against surfaces. In most cases, keeping vegetation off buildings, repairing damaged materials, replacing flashings, rehanging gutters, repairing downspouts, repointing mortar, caulking perimeter joints around windows and doors, and repainting surfaces can alleviate most sources of unwanted exterior moisture from entering a building above grade. 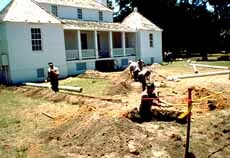 Below grade ground moisture is a major source of unwanted moisture for historic and older buildings. Proper handling of surface rain run-off is one of the most important measures of controlling unwanted ground moisture. Rain water is often referred to as "bulk moisture" in areas that receive significant annual rainfalls or infrequent, but heavy, precipitation. For example, a heavy rain of 2" per hour can produce 200 gallons of water from downspout discharge alone for a house during a one hour period. When soil is saturated at the base of the building, the moisture will wet footings and crawl spaces or find its way through cracks in foundation walls and enter into basements. Moisture in saturated basement or foundation walls-also exacerbated by high water tables-will generally rise up within a wall and eventually cause deterioration of the masonry and adjacent wooden structural elements. 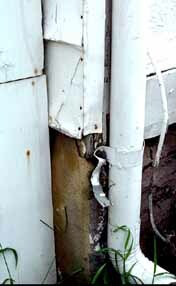 A clogged or broken downspout causes the water to pour directly into the ground. NPS files. Photo: NPS files. Builders traditionally left a working area, known as a builder's trench, around the exterior of a foundation wall. These trenches have been known to increase moisture problems if the infill soil is less than fully compacted or includes rubble backfill, which, in some cases, may act as a reservoir holding damp materials against masonry walls. Broken subsurface pipes or downspout drainage can leak into the builder's trench and dampen walls some distance from the source. Any subsurface penetration of the foundation wall for sewer, water, or other piping also can act as a direct conduit of ground moisture unless these holes are well sealed. A frequently unsuspected, but serious, modern source of ground moisture is a landscape irrigation system set too close to the building. Incorrect placement of sprinkler heads can add a tremendous amount of moisture at the foundation level and on wall surfaces. The ground, and subsequently the building, will stay much drier by 1) re-directing rain water away from the foundation through sloping grades, 2) capturing and disposing downspout water well away from the building, 3) developing a controlled ground gutter or effective drainage for buildings historically without gutters and downspouts, and 4) reducing splash-back of moisture onto foundation walls. The excavation of foundations and the use of dampproof coatings and footing drains should only be used after the measures of reducing ground moisture listed above have been implemented. Leaking plumbing pipes and mechanical equipment can cause immediate or long-term damage to historic building interiors. Routine maintenance, repair, or, if necessary, replacement of older plumbing and mechanical equipment are common solutions. Older water and sewer pipes are subject to corrosion over time. Slow leaks at plumbing joints hidden within walls and ceilings can ultimately rot floor boards, stain ceiling plaster, and lead to decay of structural members. Frozen pipes that crack can damage interior finishes. In addition to leaking plumbing pipes, old radiators in some historic buildings have been replaced with water-supplied fan coil units which tend to leak. These heating and cooling units, as well as central air equipment, have overflow and condensation pans that require cyclical maintenance to avoid mold and mildew growth and corrosion blockage of drainage channels. Uninsulated forced-air sheet metal ductwork and cold water pipes in walls and ceilings often allow condensation to form on the cold metal, which then drips and causes bubbling plaster and peeling paint. Careful design and vigilant maintenance, as well as repair and insulating pipes or ductwork, will generally rid the building of these common sources of moisture. Interior moisture from building use and modern humidified heating and cooling systems can create serious problems. In northern U.S. climates, heated buildings will have winter-time relative humidity levels ranging from 10%-35% Relative Humidity (RH). A house with four occupants generates between 10 and 16 pounds of water a day (approximately 1 Ω- 2 gallons) from human residents. Moisture from food preparation, showering, or laundry use will produce condensation on windows in winter climates. If adequate ventilation is installed, damage to interior walls such as this can be prevented. NPS files.Photo: NPS files. When one area or floor of a building is air-conditioned and another area is not, there is the chance for condensation to occur between the two areas. Most periodic condensation does not create a long-term problem. Humidified climate control systems are generally a major problem in museums housed within historic buildings. They produce between 35%-55% RH on average which, as a vapor, will seek to dissipate and equalize with adjacent spaces. Moisture can form on single-glazed windows in winter with exterior temperatures below 30∞F and interior temperatures at 70∞F with as little as 35% RH. Frequent condensation on interior window surfaces is an indication that moisture is migrating into exterior walls, which can cause long-term damage to historic materials. Materials and wall systems around climate controlled areas may need to be made of moisture resistant finishes in order to handle the additional moisture in the air. Moist interior conditions in hot and humid climates will generate mold and fungal growth. Unvented mechanical equipment, such as gas stoves, driers, and kerosene heaters, generate large quantities of moisture. It is important to provide adequate ventilation and find a balance between interior temperature, relative humidity, and airflow to avoid interior moisture that can damage historic buildings. Moisture from maintenance and construction materials can cause damage to adjacent historic materials. Careless use of liquids to wash floors can lead to water seepage through cracks and dislodge adhesives or cup and curl materials. High-pressure power washing of exterior walls and roofing materials can force water into construction joints where it can dislodge mortar, lift roofing tiles, and saturate frame walls and masonry. Replastered or newly plastered interior walls or the construction of new additions attached to historic buildings may hold moisture for months; new plaster, mortar, or concrete should be fully cured before they are painted or finished. The use of materials in projects that have been damaged by moisture prior to installation or have too high a moisture content may cause concealed damage. Knowing the five most common sources of moisture that cause damage to building materials is the first step in diagnosing moisture problems. But it is also important to understand the basic mechanisms that affect moisture movement in buildings. Moisture transport, or movement, occurs in two states: liquid and vapor. It is directly related to pressure differentials. For example, water in a gaseous or vapor state, as warm moist air, will move from its high pressure area to a lower pressure area where the air is cooler and drier. Liquid water will move as a result of differences in hydrostatic pressure or wind pressure. It is the pressure differentials that drive the rate of moisture migration in either state. Because the building materials themselves resist this moisture movement, the rate of movement will depend on two factors: the permeability of the materials when affected by vapor and the absorption rates of materials in contact with liquid. The dynamic forces that move air and moistue through a building are important to understand, particularly when selecting a treatment to correct a moisture problem. This drawing shows how moisture can invade "inward" from the exterior; "upward" from the ground; and be generated from "within" the interior. All have damaging effects. Drawing: NPS files. The mechanics, or physics, of moisture movement is complex, but if the driving force is difference in pressure, then an approach to reducing moisture movement and its damage is to reduce the difference in pressure, not to increase it. That is why the treatments discussed in this Brief will look at managing moisture by draining bulk moisture and ventilating vapor moisture before setting up new barriers with impermeable coatings or over-pressurized new climate control systems that threaten aging building materials and archaic construction systems. Three forms of moisture transport are particularly important to understand in regards to historic buildings—infiltration, capillary action, and vapor diffusion—remembering, at the same time, that the subject is infinitely complex and, thus, one of continuing scientific study. Buildings were traditionally designed to deal with the movement of air. For example, cupolas and roof lanterns allowed hot air to rise and provided a natural draft to pull air through buildings. Cavity walls in both frame and masonry buildings were constructed to allow moisture to dissipate in the air space between external and internal walls. Radiators were placed in front of windows to keep cold surfaces warm, thereby reducing condensation on these surfaces. Many of these features, however, have been altered over time in an effort to modernize appearances, improve energy efficiency, or accommodate changes in use. The change in use will also affect moisture movement, particularly in commercial and industrial buildings with modern mechanical systems. Therefore, the way a building handles air and moisture today may be different from that intended by the original builder or architect, and poorly conceived changes may be partially responsible for chronic moisture conditions. Moisture moves into and through materials as both a visible liquid (capillary action) and as a gaseous vapor (infiltration and vapor diffusion). Moisture from leaks, saturation, rising damp, and condensation can lead to the deterioration of materials and cause an unhealthy environment. Moisture in its solid form, ice, can also cause damage from frozen, cracked water pipes, or split gutter seams or spalled masonry from freeze-thaw action. Moisture from melting ice dams, leaks, and condensation often can travel great distances down walls and along construction surfaces, pipes, or conduits. The amount of moisture and how it deteriorates materials is dependent upon complex forces and variables that must be considered for each situation. Determining the way moisture is handled by the building is further complicated because each building and site is unique. Water damage from blocked gutters and downspouts can saturate materials on the outside, and high levels of interior moisture can saturate interior materials. Difficult cases may call for technical evaluation by consultants specializing in moisture monitoring and diagnostic evaluation. In other words, it may take a team to effectively evaluate a situation and determine a proper approach to controlling moisture damage in old buildings. Infiltration is created by wind, temperature gradients (hot air rising), ventilation fan action, and the stack or chimney effect that draws air up into tall vertical spaces. Infiltration as a dynamic force does not actually move liquid water, but is the vehicle by which dampness, as a component of air, finds its way into building materials. Older buildings have a natural air exchange, generally from 1 to 4 changes per hour, which, in turn, may help control moisture by diluting moisture within a building. The tighter the building construction, however, the lower will be the infiltration rate and the natural circulation of air. In the process of infiltration, however, moisture that has entered the building and saturated materials can be drawn in and out of materials, thereby adding to the dampness in the air. 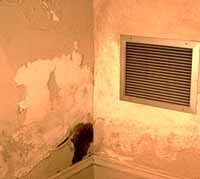 Inadequate air circulation where there is excessive moisture (i.e., in a damp basement), accelerates the deterioration of historic materials. To reduce the unwanted moisture that accompanies infiltration, it is best to incorporate maintenance and repair treatments to close joints and weatherstrip windows, while providing controlled air exchanges elsewhere. The worst approach is to seal the building so completely, while limiting fresh air intake, that the building cannot breathe. Capillary action occurs when moisture in saturated porous building materials, such as masonry, wicks up or travels vertically as it evaporates to the surface. In capillary attraction, liquid in the material is attracted to the solid surface of the pore structure causing it to rise vertically; thus, it is often called "rising damp," particularly when found in conjunction with ground moisture. It should not, however, be confused with moisture that laterally penetrates a foundation wall through cracks and settles in the basement. 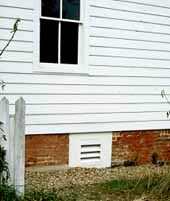 Not easily controlled, most rising damp comes from high water tables or a constant source under the footing. In cases of damp masonry walls with capillary action, there is usually a whitish stain or horizontal tide mark of efflorescence that seasonally fluctuates about 1- 3 feet above grade where the excess moisture evaporates from the wall. This tide mark is full of salt crystals, that have been drawn from the ground and building materials along with the water, making the masonry even more sensitive to additional moisture absorption from the surrounding air. Capillary migration of moisture may occur in any material with a pore structure where there is a constant or recurring source of moisture. The best approach for dealing with capillary rise in building materials is to reduce the amount of water in contact with historic materials. If that is not possible due to chronically high water tables, it may be necessary to introduce a horizontal damp-proof barrier, such as slate course or a lead or plastic sheet, to stop the vertical rise of moisture. Moisture should not be sealed into the wall with a waterproof coating, such as cement parging or vinyl wall coverings, applied to the inside of damp walls. This will only increase the pressure differential as a vertical barrier and force the capillary action, and its destruction of materials, higher up the wall. Vapor diffusion is the natural movement of pressurized moisture vapor through porous materials. It is most readily apparent as humidified interior air moves out through walls to a cooler exterior. In a hot and humid climate, the reverse will happen as moist hot air moves into cooler, dryer, air-conditioned, interiors. The movement of the moisture vapor is not a serious problem until the dewpoint temperature is reached and the vapor changes into liquid moisture known as condensation. This can occur within a wall or on interior surfaces. Vapor diffusion will be more of a problem for a frame structure with several layers of infill materials within the frame cavity than a dense masonry structure. Condensation as a result of vapor migration usually takes place on a surface or film, such as paint, where there is a change in permeability. The installation of climate control systems in historic buildings (mostly museums) that have not been properly designed or regulated and that force pressurized damp air to diffuse into perimeter walls is an ongoing concern. These newer systems take constant monitoring and back-up warning systems to avoid moisture damage. Long-term and undetected condensation or high moisture content can cause serious structural damage as well as an unhealthy environment, heavy with mold and mildew spores. Reducing the interior/exterior pressure differential and the difference between interior and exterior temperature and relative humidity helps control unwanted vapor diffusion. This can sometimes be achieved by reducing interior relative humidity. In some instances, using vapor barriers, such as heavy plastic sheeting laid over damp crawl spaces, can have remarkable success in stopping vapor diffusion from damp ground into buildings. Yet, knowledgeable experts in the field differ regarding the appropriateness of vapor barriers and when and where to use them, as well as the best way to handle natural diffusion in insulated walls. Adding insulation to historic buildings, particularly in walls of wooden frame structures, has been a standard modern weatherization treatment, but it can have a disastrous effect on historic buildings. The process of installing the insulation destroys historic siding or plaster, and it is very difficult to establish a tight vapor barrier. While insulation has the benefit of increasing the efficiency of heating and cooling by containing temperature controlled air, it does not eliminate surfaces on which damaging moisture can condense. For insulated residential frame structures, the most obvious sign of a moisture diffusion problem is peeling paint on wooden siding, even after careful surface preparation and repainting. Vapor impermeable barriers such as plastic sheeting, or more accurately, vapor retarders, in cold and moderate climates generally help slow vapor diffusion where it is not wanted. In regions where humidified climate control systems are installed into insulated frame buildings, it is important to stop interstitial, or in-wall, dewpoint condensation. This is very difficult because humidified air can penetrate breaches in the vapor barrier, particularly around electrical outlets. Improperly or incompletely installed retrofit vapor barriers will cause extensive damage to the building, just in the installation process, and will allow trapped condensation to wet the insulation and sheathing boards, corrode metal elements such as wiring cables and metal anchors, and blister paint finishes. Providing a tight wall vapor barrier, as well as a ventilated cavity behind wooden clapboards or siding appears to help insulated frame walls, if the interior relative humidity can be adjusted or monitored to avoid condensation. Correct placement of vapor retarders within building construction will vary by region, building construction, and type of climate control system. It is important for the building to be surveyed first and the evidence and location of suspected moisture damage systematically recorded before undertaking any major work to correct the problem. This will give a baseline from which relative changes in condition can be noted. When materials become wet, there are specific physical changes that can be detected and noted in a record book or on survey sheets. Every time there is a heavy rain, snow storm, water in the basement, or mechanical systems failure, the owner or consultant should note and record the way moisture is moving, its appearance, and what variables might contribute to the cause. Standing outside to observe a building in the rain may answer many questions and help trace the movement of water into the building. Evidence of deteriorating materials that cover more serious moisture damage should also be noted, even if it is not immediately clear what is causing the damage. ( For example, water stains on the ceiling may be from leaking pipes, blocked fan coil drainage pans above, or from moisture which has penetrated around a poorly sloped window sill above.) Don't jump to conclusions, but use a systematic approach to help establish an educated theory-or hypothesis-of what is causing the moisture problem or what areas need further investigation. Surveying moisture damage must be systematic so that relative changes can be noted. Tools for investigating can be as simple as a notebook, sketch plans, binoculars, camera, aluminum foil, smoke pencil, and flashlight. The systematic approach involves looking at buildings from the top down and from the outside to the inside. Photographs, floor plans, site plan, and exterior elevations-even roughly sketched-should be used to indicate all evidence of damp or damaged materials, with notations for musty or poorly ventilated areas. Information might be needed on the absorption and permeability characteristics of the building materials and soils. Exterior drainage patterns should be noted and these base plans referred to on a regular basis in different seasons and in differing types of weather. It is best to start with one method of periodic documentation and to use this same method each time. Because moisture is affected by gravity, many surveys start with the roof and guttering systems and work down through the exterior walls. Any obvious areas of water penetration, damaged surfaces, or staining should be noted. Any recurring damp or stain patterns, both exterior and interior, should also be noted with a commentary on the temperature, weather, and any other facts that may be relevant (driving rains, saturated soil, high interior humidity, recent washing of the building, presence of a lawn watering system, etc.). The interior should be recorded as well, beginning with the attic and working down to the basement and crawl space. It may be necessary to remove damaged materials selectively in order to trace the path of moisture or to pinpoint a source, such as a leaking pipe in the ceiling. The use of a basic resistance moisture meter, available in many hardware stores, can identify moisture contents of materials and show, over time, if wall surfaces are drying or becoming damper. A smoke pencil can chart air infiltration around windows or draft patterns in interior spaces. For a quick test to determine if a damp basement is caused by saturated walls or is a result of condensation, tape a piece of foil onto a masonry surface and check it after a day or two; if moisture has developed behind the foil, then it is coming from the masonry. If condensation is on the surface of the foil, then moisture is from the air. Comparing current conditions with previous conditions, historic drawings, photographs, or known alterations may also assist in the final diagnosis. A chronological record, showing improvement or deterioration, should be backed up with photographs or notations as to the changing size, condition, or features of the deterioration and how these changes have been affected by variables of temperature and rainfall. If a condition can be related in time to a particular event, such as efflorescence developing on a chimney after the building is no longer heated, it may be possible to isolate a cause, develop a hypothesis, and then test the hypothesis (by adding some temporary heat), before applying a remedial treatment. If the owner or consultant has access to moisture survey and monitoring equipment such as resistance moisture meters, dewpoint indicators, salt detectors, infrared thermography systems, psychrometer, fiber-optic boroscopes, and miniaturized video cameras, additional quantified data can be incorporated into the survey. If it is necessary to track the wetting and drying of walls over a period of time, deep probes set into walls and in the soil with connector cables to computerized data loggers or the use of long-term recording of hygrothermographs may require a trained specialist. Miniaturized fiber-optic video cameras can record the condition of subsurface drain lines without excavation. It should be noted, however, that instrumentation, while extremely useful, cannot take the place of careful personal observation and analysis. Relying on instrumentation alone rarely will give the owner the information needed to fully diagnose a moisture problem. To avoid jumping to a quick-potentially erroneous-conclusion, a series of questions should be asked first. This will help establish a theory or hypothesis that can be tested to increase the chances that a remedial treatment will control or manage existing moisture. How is water draining around building and site? What is the effectiveness of gutters and downspouts? Are the slopes or grading around foundations adequate? What are the locations of subsurface features such as wells, cisterns, or drainage fields? Are there subsurface drainage pipes (or drainage boots) attached to the downspouts and are they in good working condition? Does the soil retain moisture or allow it to drain freely? Where is the water table? Are there window wells holding rain water? What is the flow rate of area drains around the site (can be tested with a hose for several minutes)? Is the storm piping out to the street sufficient for heavy rains, or does water chronically back up on the site? Has adjacent new construction affected site drainage or water table levels? How does water/moisture appear to be entering the building? Have all five primary sources of moisture been evaluated? What is the condition of construction materials and are there any obvious areas of deterioration? Did this building have a builder's trench around the foundation that could be holding water against the exterior walls? Are the interior bearing walls as well as the exterior walls showing evidence of rising damp? Is there evidence of hydrostatic pressure under the basement floor such as water percolating up through cracks? Has there been moisture damage from an ice dam in the last several months? Is damage localized, on one side of the building only, or over a large area? What are the principal moisture dynamics? Is the moisture condition from liquid or vapor sources? Is the attic moisture a result of vapor diffusion as damp air comes up through the cavity walls from the crawl space or is it from a leaking roof? Is the exterior wall moisture from rising damp with a tide mark or are there uneven spots of dampness from foundation splash back, or other ground moisture conditions? Is there adequate air exchange in the building, particularly in damp areas, such as the basement? Has the height of the water table been established by inserting a long pipe into the ground in order to record the water levels? How is the interior climate handling moisture? Are there areas in the building that do not appear to be ventilating well and where mold is growing? Are there historic features that once helped the building control air and moisture that can be reactivated, such as operable skylights or windows? Could dewpoint condensation be occurring behind surfaces, since there is often condensation on the windows? Does the building feel unusually damp or smell in an unusual way that suggest the need for further study? Is there evidence of termites, carpenter ants, or other pests attracted to moist conditions? Is a dehumidifier keeping the air dry or is it, in fact, creating a cycle where it is actually drawing moisture through the foundation wall? The owner used long black extender pipes to test a theory that it was faulty roof drainage causing the problem. Photo: NPS files. Does the moisture problem appear to be intermittent, chronic, or tied to specific events? Are damp conditions occurring within two hours of a heavy rain or is there a delayed reaction? Does rust on most nail heads in the attic indicate a condensation problem? What are the wet patterns that appear on a building wall during and after a rain storm? Is it localized or in large areas? Can these rain patterns be tied to gutter over-flows, faulty flashing, or saturation of absorbent materials? Is a repaired area holding up well over time or is there evidence that moisture is returning? Do moisture meter readings of wall cavities indicate they are wet, suggesting leaks or condensation in the wall? Once a hypothesis of the source or sources of the moisture has been developed from observation and recording of data, it is often useful to prove or disprove this hypothesis with interim treatments, and, if necessary, the additional use of instrumentation to verify conditions. For damp basements, test solutions can help determine the cause. For example, surface moisture in low spots should be redirected away from the foundation wall with regrading to determine if basement dampness improves. If there is still a problem, determine if subsurface downspout collection pipes or cast iron boots are not functioning properly. The above grade downspouts can be disconnected and attached to long, flexible extender pipes and redirected away from the foundation. If, after a heavy rain or a simulation using a hose, there is no improvement, look for additional ground moisture sources such as high water tables, hidden cisterns, or leaking water service lines as a cause of moisture in the basement. New data will lead to a new hypothesis that should be tested and verified. The process of elimination can be frustrating, but is required if a systematic method of diagnosis is to be successful. The treatments that follow this section in chart format are divided into levels based on the degree of moisture problems. Level I covers preservation maintenance; Level II focuses on repair using historically compatible materials and essentially mitigating damaging moisture conditions; and Level III discusses replacement and alteration of materials that permit continued use in a chronically moist environment. It is important to begin with Level I and work through to a manageable treatment as part of the control of moisture problems. Buildings in serious decay will require treatments in Level II, and difficult or unusual site conditions may require more aggressive treatments in Level III. Caution should always be exercised when selecting a treatment. The treatments listed are a guide and not intended to be recommendations for specific projects as the key is always proper diagnosis. Start with the repair of any obvious deficiencies using sound preservation maintenance. If moisture cannot be managed by maintenance alone, it is important to reduce it by mitigating problems before deteriorated historic materials are replaced. Treatments should not remove materials that can be preserved; should not involve extensive excavation unless there is a documented need; and should not include coating buildings with waterproof sealers that can exacerbate an existing problem. Some alteration to historic materials, structural systems, mechanical systems, windows, or finishes may be needed when excessive site moisture cannot be controlled by drainage systems, or in areas prone to floods. These changes, however, should, be sensitive to preserving those materials, features, and finishes that convey the historic character of the building and site. Exterior: Apply cyclical maintenance procedures to eliminate rain and moisture infiltration. Installing ventilating fans can improve damp conditions or reduce cooling loads. Photo: NPS files. Roofing/ guttering: Make weather-tight and operational; inspect and clean gutters as necessary depending on number of nearby trees, but at least twice a year; inspect roofing at least once a year, preferably spring; replace missing or damaged roofing shingles, slates, or tiles; repair flashing; repair or replace cracked downspouts. Walls: Repair damaged surface materials; repoint masonry with appropriately formulated mortar; prime and repaint wooden, metal, or masonry elements or surfaces; remove efflorescence from masonry with non-metallic bristle brushes. Window and door openings: Eliminate cracks or open joints; caulk or repoint around openings or steps; repair or reset weatherstripping; check flashing; repaint, as necessary. Ground: Apply regular maintenance procedures to eliminate standing water and vegetative threats to building/site. Grade: Eliminate low spots around building foundations; clean out existing downspout boots twice a year or add extension to leaders to carry moisture away from foundation; do a hose test to verify that surface drains are functioning; reduce moisture used to clean steps and walks; eliminate the use of chlorides to melt ice which can increase freeze/thaw spalling of masonry; check operation of irrigation systems, hose bib leaks, and clearance of air conditioning condensate drain outlets. Crawl space: Check crawl space for animal infestation, termites, ponding moisture, or high moisture content; check foundation grilles for adequate ventilation; seasonally close grilles when appropriate-in winter, if not needed, or in summer if hot humid air is diffusing into air conditioned space. Foliage: Keep foliage and vines off buildings; trim overhanging trees to keep debris from gutters and limbs from rubbing against building; remove moisture retaining elements, such as firewood, from foundations. A vent may be added if there is none. Close grilles in the summer, if hot humid air is getting into air conditioned spaces. Photo: NPS files. Basements and foundations: Increase ventilation and maintain surfaces to avoid moisture. Equipment: Check dehumidifiers, sump pump, vent fans, and water detection or alarm systems for proper maintenance as required; check battery back-up twice a year. Piping/ductwork: Check for condensation on pipes and insulate/seal joints, if necessary. Interior: Maintain equipment to reduce leaks and interior moisture. Plumbing pipes: Add insulation to plumbing or radiator pipes located in areas subject to freezing, such as along outside walls, in attics, or in unheated basements. Mechanical equipment: Check condensation pans and drain lines to keep clear; insulate and seal joints in exposed metal ductwork to avoid drawing in moist air. Cleaning: Routinely dust and clean surfaces to reduce the amount of water or moist chemicals used to clean building; caulk around tile floor and wall connections; and maintain floor grouts in good condition. Ventilation: Reduce household-produced moisture, if a problem, by increasing ventilation; vent clothes driers to the outside; install and always use exhaust fans in restrooms, bathrooms, showers, and kitchens, when in use. Exterior: Repair features that have been damaged. Replace an extensively deteriorated feature with a new feature that matches in design, color, texture, and where possible, materials. New drainage systems for roof run-off may be installed in order to remove moisture from the base of the building. Photo: NPS files. Roofing: Repair roofing, parapets and overhangs that have allowed moisture to enter; add ice and water shield membrane to lower 3-4 feet or roofing in cold climates to limit damage from ice dams; increase attic ventilation, if heat and humidity build-up is a problem. Make gutters slope @ 1/8" to the foot. Use professional handbooks to size gutters and reposition, if necessary and appropriate to historic architecture. Add ventilated chimney caps to unused chimneys that collect rain water. Walls: Repair spalled masonry, terra cotta, etc. by selectively installing new masonry units to match; replace rotted clapboards too close to grade and adjust grade or clapboards to achieve adequate clearance; protect or cover open window wells. Ground: Correct serious ground water problems; capture and dispose of downspout water away from foundation; and control vapor diffusion of crawlspace moisture. Grade: Re-establish positive sloping of grade; try to obtain 6" of fall in the first 10' surrounding building foundation; for buildings without gutter systems, regrade and install a positive subsurface collection system with gravel, or waterproof sheeting and perimeter drains; adjust pitch or slope of eave line grade drains or French drains to reduce splash back onto foundation walls; add subsurface drainage boots or extension pipes to take existing downspout water away from building foundation to the greatest extent feasible. Crawl space: Add polyethylene vapor barrier (heavy construction grade or Mylar ) to exposed dirt in crawlspace if monitoring indicates it is needed and there is no rising damp; add ventilation grilles for additional cross ventilation, if determined advisable. Foundations and Basements: Correct existing high moisture levels, if other means of controlling ground moisture are inadequate. Mechanical devices: Add interior perimeter drains and sump pump; add dehumidifiers for seasonal control of humidity in confined, unventilated space ( but don't create a problem with pulling dampness out of walls); add ventilator fans to improve air flow, but don't use both the dehumidifier and ventilator fan at the same time. Walls: Remove commentates coatings, if holding rising damp in walls; coat walls with vapor permeable lime based rendering plaster, if damp walls need a sacrificial coating to protect mortar from erosion; add termite shields, if evidence of termites and dampness cannot be controlled. Framing: Reinforce existing floor framing weakened by moisture by adding lolly column support and reinforcing joist ends with sistered or parallel supports. Add a vapor impermeable shield, preferably non-ferrous metal, under wood joists coming into contact with moist masonry. Plumbing: Replace older pipes and fixtures subject to leaking or overflowing; insulate water pipes subject to condensation. Ventilation: Add exhaust fans and whole house fans to increase air flow through buildings, if areas are damp or need more ventilation to control mold and mildew. Climate: Adjust temperature and relative humidity to manage interior humidity; Correct areas of improperly balanced pressure for HVAC systems that may be causing a moisture problem. Roofs: Add ventilator fans to exhaust roofs but avoid large projecting features whose designs might negatively affect the appearance of the historic roof. When replacing roofs, correct conditions that have caused moisture problems, but keep the overall appearance of the roof; for example, ventilate under wooden shingles, or detail standing seams to avoid buckling and cracking. Be attentive to provide extra protection for internal or built-in gutters by using the best quality materials, flashing, and vapor impermeable connection details. Walls: If insulation and vapor barriers are added to frame walls, consider maintaining a ventilation channel behind the exterior cladding to avoid peeling and blistering paint occurrences. Windows: Consider removable exterior storm windows, but allow operation of windows for periodic ventilation of cavity between exterior storm and historic sash. For stained glass windows using protective glazing, use only ventilated storms to avoid condensation as well as heat build-up. Ground: Control excessive ground moisture. This may require extensive excavations, new drainage systems, and the use of substitute materials. These may include concrete or new sustainable recycled materials for wood in damp areas when they do not impact the historic appearance of the building. Grade: Excavate and install water collection systems to assist with positive run-off of low lying or difficult areas of moisture drainage; use drainage mats and under finished grade to improve run-off control; consider the use of column plinth blocks or bases that are ventilated or constructed of non-absorbent substitute materials in chronically damp areas. Replace improperly sloped walks; repair non-functioning catch basins and site drains; repair settled areas around steps and other features at grade. Foundations: Improve performance of foundation walls with damp-proof treatments to stop infiltration or damp course layers to stop rising damp. Some substitute materials may need to be selectively integrated into new features. Walls: excavate, repoint masonry walls, add footing drains, and waterproof exterior subsurface walls; replace wood sill plates and deteriorated structural foundations with new materials, such as pressure treated wood, to withstand chronic moisture conditions; materials may change, but overall appearance should remain similar. Add dampcourse layer to stop rising damp; avoid chemical injections as these are rarely totally effective, are not reversible, and are often visually intrusive. Interior: Control the amount of moisture and condensation on the interiors of historic buildings. Most designs for new HVAC systems will be undertaken by mechanical engineers, but systems should be selected that are appropriate to the resource and intended use. Windows, skylights: Add double and triple glazing, where necessary to control condensation. Avoid new metal sashes or use thermal breaks where prone to heavy condensation. Mechanical systems: Design new systems to reduce stress on building exterior. This might require insulating and tightening up the building exterior, but provisions must be made for adequate air flow. A new zoned system, with appropriate transition insulation, may be effective in areas with differing climatic needs. Control devices/Interior spaces: If new climate control systems are added, design back-up controls and monitoring systems to protect from interior moisture damage. Walls: If partition walls sit on floors that periodically flood, consider spacers or isolation membranes behind baseboards to stop moisture from wicking up through absorbent materials. Once the building has been repaired and the larger moisture issues addressed, it is important to keep a record of additional evidence of moisture problems and to protect the historic or old building through proper cyclical maintenance. In some cases, particularly in museum environments, it is critical to monitor areas vulnerable to moisture damage. In a number of historic buildings, in-wall moisture monitors are used to ensure that the moisture purposely generated to keep relative humidity at ranges appropriate to a museum collection does not migrate into walls and cause deterioration. The potential problem with all systems is the failure of controls, valves, and panels over time. Back-up systems, warning devices, properly trained staff and an emergency plan will help control damage if there is a system failure. Ongoing maintenance and vigilance to situations that could potentially cause moisture damage must become a routine part of the everyday life of a building. The owner or staff responsible for the upkeep of the building should inspect the property weekly and note any leaks, mustiness, or blocked drains. Again, observing the building during a rain will test whether ground and gutter drainage are working well. For some buildings a back-up power system may be necessary to keep sump pumps working during storms when electrical power may be lost. For mechanical equipment rooms, condensation pans, basement floors, and laundry areas where early detection of water is important, there are alarms that sound when their sensors come into contact with moisture. Moisture in old and historic buildings, though difficult to evaluate, can be systematically studied and the appropriate protective measures taken. Much of the documentation and evaluation is based on common sense combined with an understanding of historic building materials, construction technology, and the basics of moisture and air movement. Variables can be evaluated step by step and situations creating direct or secondary moisture damage can generally be corrected. The majority of moisture problems can be mitigated with maintenance, repair, control of ground and roof moisture, and improved ventilation. For more complex situations, however, a thorough diagnosis and an understanding of how the building handles moisture at present, can lead to a treatment that solves the problem without damaging the historic resource. It is usually advantageous to eliminate one potential source of moisture at a time. Simultaneous treatments may set up a new dynamic in the building with its own set of moisture problems. Implementing changes sequentially will allow the owner or preservation professional to track the success of each treatment. Moisture problems can be intimidating to a building owner who has diligently tried to control them. Keeping a record of evidence of moisture damage, results of diagnostic tests, and remedial treatments, is beneficial to a building's long-term care. The more complete a survey and evaluation, the greater the success in controlling unwanted moisture now and in the future. Holding the line on unwanted moisture in buildings will be successful if 1) there is constant concern for signs of problems and 2) there is ongoing physical care provided by those who understand the building, site, mechanical systems, and the previous efforts to deal with moisture. For properties with major or difficult-to-diagnose problems, a team approach is often most effective. The owner working with properly trained contractors and consultants can monitor, select, and implement treatments within a preservation context in order to manage moisture and to protect the historic resource. Air flow/ infiltration: The movement that carries moist air into and through materials. 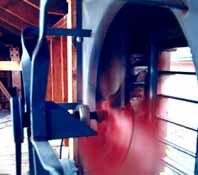 Air flow depends on the difference between indoor and outdoor pressures, wind speed and direction as well as the permeability of materials. Bulk water: The large quantity of moisture from roof and ground run-off that can enter into a building either above grade or below grade. Capillary action: The force that moves moisture through the pore structure of materials. Generally referred to as rising damp, moisture at or below the foundation level will rise vertically in a wall to a height at which the rate of evaporation balances the rate at which it can be drawn up by capillary forces. Condensation: The physical process by which water vapor is transformed into a liquid when the relative humidity of the air reaches 100% and the excess water vapor forms, generally as droplets, on the colder adjacent surface. Convection: Heat transfer through the atmosphere by a difference in force or air pressure is one type of air transport. Sometimes referred to as the "stack effect," hotter less dense air will rise, colder dense air will fall creating movement of air within a building. Dewpoint: The temperature at which water vapor condenses when the air is cooled at a constant pressure and constant moisture content. Diffusion: The movement of water vapor through a material. Diffusion depends on vapor pressure, temperature, relative humidity, and the permeability of a material. Evaporation: The transformation of liquid into a vapor, generally as a result of rise of temperature, is the opposite of condensation. Moisture in damp soil, such as in a crawl space, can evaporate into the air, raise the relative humidity in that space, and enter the building as a vapor. Ground moisture: The saturated moisture in the ground as a result of surface run-off and naturally occuring water tables. Ground moisture can penetrate through cracks and holes in foundation walls or can migrate up from moisture under the foundation base. Monitoring instrumentation: These devices are generally used for long term diagnostic analysis of a problem, or to measure the performance of a treatment, or to measure changes of conditions or environment. In-wall probes or sensors are often attached to data-loggers which can be down-loaded into computers. Permeability: A characteristic of porosity of a material generally listed as the rate of diffusion of a pressurized gas through a material. The pore structure of some materials allows them to absorb or adsorb more moisture than other materials. Limestones are generally more permeable than granites. Relative humidity (RH): Dampness in the air is measured as the percent of water vapor in the air at a specific temperature relative to the amount of water vapor that can be held in a vapor form at that specific temperature. Survey instrumentation: technical instrumentation that is used on-site to provide quick readings of specific physical conditions. Generally these are hand-held survey instruments, such as moisture, temperature and relative humidity readers, dewpoint sensors, and fiber optic boroscopes. Sharon C. Park, AIA is the Senior Historical Architect, Technical Preservation Services, Heritage Preservation Services Program, National Park Service, Washington, D.C. The author wishes to thank the following individuals and organizations for providing technical review and other assistance in developing this publication: The attendees, speakers, and sponsors of the Diagnosing Moisture in Historic Buildings Symposium held in Washington, DC in 1996 and funded by a grant from the National Center for Preservation Technology and Training, National Park Service ; Hugh C. Miller, FAIA; Michael Henry, AIA, PE, PP; Baird M. Smith, AIA; Ernest A. Conrad, P.E. ; William B. Rose; Rebecca Stevens. AIA; Wendy Claire Jessup; Elizabeth Sasser, AIA; Bryan Blundell; George Siekkinen, AIA; Larry D. Dermody; Kimberly A. Konrad; Barbara J. Mangum and the Isabella Stewart Gardner Museum, Boston; Gunston Hall Plantation; Friends of Meridian Hill; Friends of Great Falls Tavern; The National Trust for Historic Preservation; Thomas McGrath, Douglas C. Hicks and The Williamsport Preservation Training Center, NPS; the staff at Heritage Preservation Services, NPS, Charles E. Fisher, Brooks Prueher, Anne E. Grimmer, Antoinette Lee, and especially Kay D. Weeks.This publication has been prepared pursuant to the National Historic Preservation Act, as amended, which directs the Secretary of the Interior to develop and make available information concerning historic properties. Comments about this publication should be directed to de Teel Patterson Tiller, Acting Manager, Heritage Preservation Services Program, National Park Service, P.O. Box 37127, Washington, DC 20013-7127. This publication is not copyrighted and can be reproduced without penalty. Copyright photographs included in this publication may not be used to illustrate publications other than as a reference to this Preservation Brief, without permission of the owners. Normal procedures for credit to the authors and the National Park Service are appreciated. Conrad, Ernest A., P.E. "The Dews and Don'ts of Insulating." Old-House Journal, May/June, 1996. Cumberland, Don, Jr. "Museum Collection Storage in an Historic Building Using a Prefabricated Structure." Preservation Tech Notes. Washington, DC: National Park Service, issue PTN-14. September, 1985. Jessup, Wendy Claire, Ed. Conservation in Context: Finding a Balance for the Historic House Museum. Washington, DC: National Trust for Historic Preservation (Symposium Proceedings March 7-8, 1994). Labine, Clem. "Managing Moisture in Historic Buildings" Special Report and Moisture Monitoring Source List. 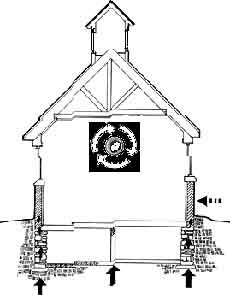 Traditional Building, Vol 9, No.2, May-June 1996. Leeke, John. 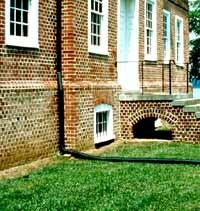 "Detecting Moisture; Methods and Tools for Evaluating Water in Old Houses." Old House Journal, May/June, 1996. Moisture Control in Buildings. Heinz R. Trechsel, Editor. Philadelphia: American Society for Testing and Materials (ASTM manual series: MNL 18), 1993. Museums in Historic Buildings (Special Issue). APT Bulletin. The Journal of Preservation Technology, Vol 26, No. 3 . Williamsburg, VA: APT, 1996. Oxley, T.A. and A. E. Gobert. Dampness in Buildings: Diagnosis, Treatment, Instruments. London, Boston: Butterworth-Heinemann, 1994. Park, Sharon C. AIA. Preservation Brief 24: Heating, Ventilating, and Cooling Historic Buildings: Problems and Recommended Approaches. Washington, DC: Department of the Interior, Government Printing Office, 1991. Park, Sharon C. AIA. Preservation Brief 31: Mothballing Historic Buildings. Washington, DC: Department of the Interior, Government Printing Office, 1993. Rose, William. "Effects of Climate Control on the Museum Building Envelope," Journal of the American Institute for Conservation, Vol. 33, No. 2. Summer, 1994. 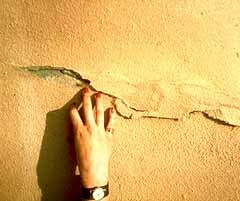 Smith, Baird M. Moisture Problems in Historic Masonry Walls; Diagnosis and Treatment. Washington, DC. : Department of the Interior, Government Printing Office, 1984. Tolpin, Jim. "Builder's Guide to Moisture Meters," Tools of the Trade Vol 2, No. 1 (Quarterly Supplement to The Journal of Light Construction). Richmond, Vermont: Builderburg Group Inc. Summer, 1994.